Classic sash window hardware hasn’t changed much throughout the various eras, whether that’s on Edwardian, Victorian or Georgian sash windows. 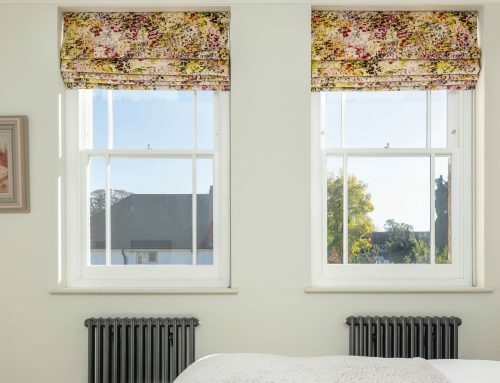 But there are still a few things to consider when choosing hardware for your sash windows, particularly if you are looking to replicate the original look of your period sash windows. 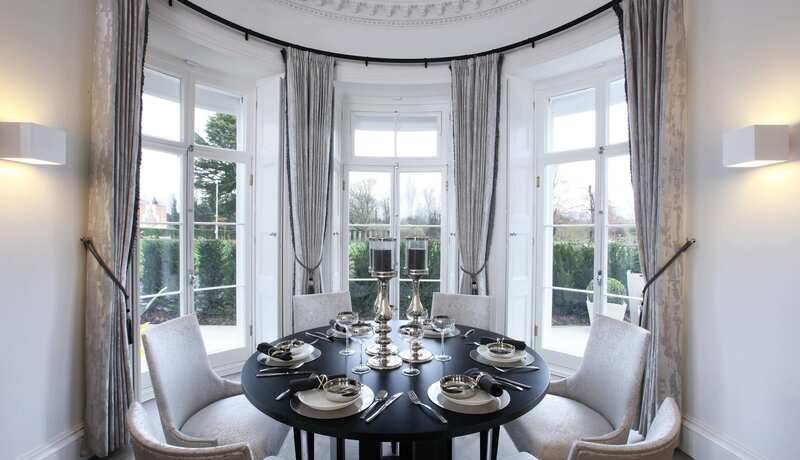 The key ironmongery features on sash windows are sash lifts and sash fasteners. 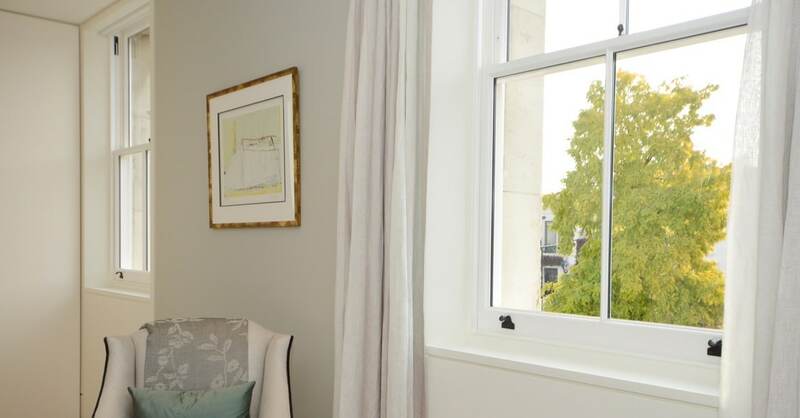 Sash lifts are fitted on the lower sash so that it can be lifted and the sash window can be opened. Sash fasteners lock the two sashes in place and align them vertically. 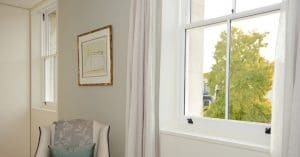 Brighton sash window fasteners (see right with Fitch fasteners) feature an adjustable screw to pull the two sashes together. 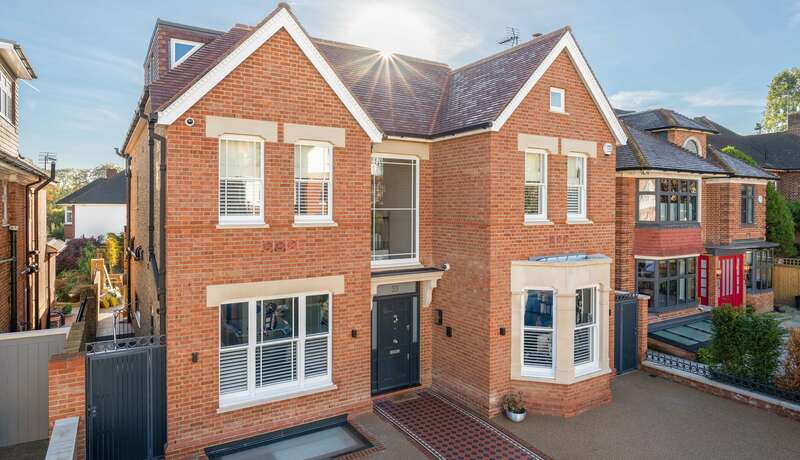 Fitch pattern sash fasteners and quadrant sash fasteners are based on more traditional designs, but cannot be adjusted as precisely as Brighton fasteners can. The three most common finishes for sash lifts and sash fasteners are polished brass, polished chrome or satin chrome. 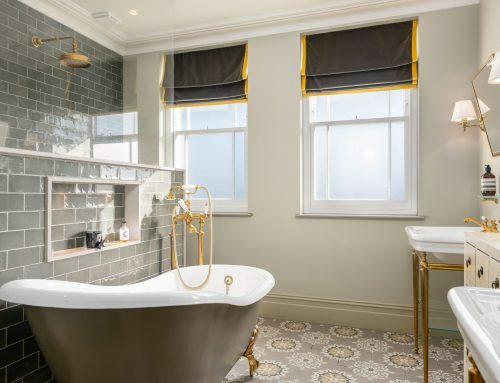 Historically, brass would have been most commonly used until the 1920s, when polished chrome became more popular. 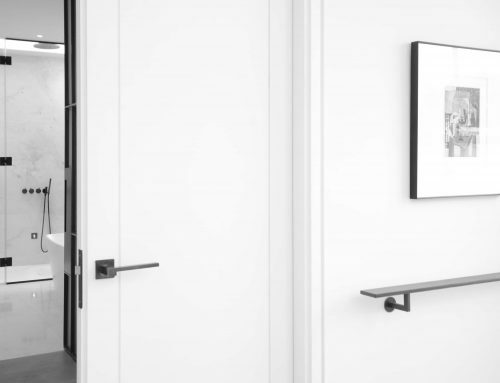 It is however possible to have alternative ironmongery finishes. 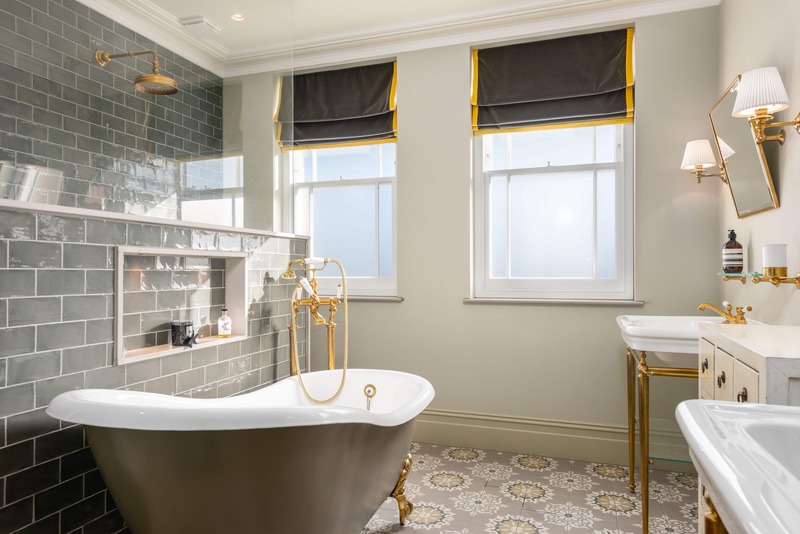 At Timbawood, as specialists in sash windows for period, conservation and listed properties, we can replicate the look of your existing sash windows, including the ironmongery, or fit ironmongery you provide. 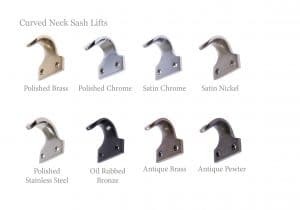 We offer a choice of 8 different finishes for our ‘Forged Hook’ Fasteners and ‘Curved Neck’ Sash Lifts (see right). 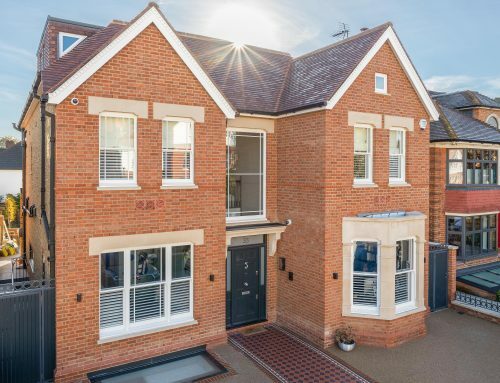 For 5 of the finishes, we are able to match our sash window hardware with our casement window hardware – if you have a property that features both types of window. 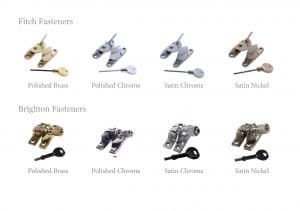 All the different combinations of both sash window and casement window hardware are available to see on our window hardware page. 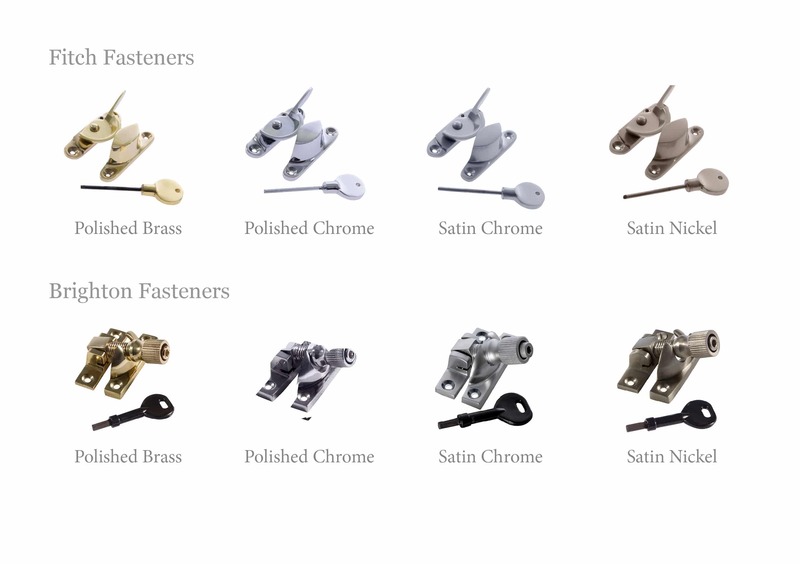 All pulleys and sash stop locks are designed to match the finish of the fasteners. 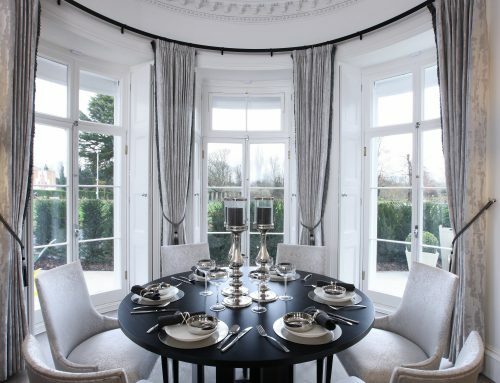 If you are only replacing a few windows in a building, it is best to match the style with the existing ironmongery. 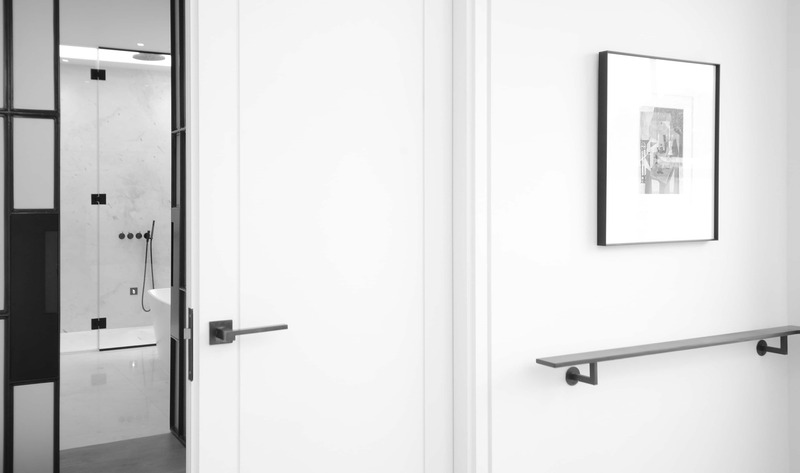 It is also worth checking with your insurance provider that the locks you would like to install will be valid with your insurance cover. 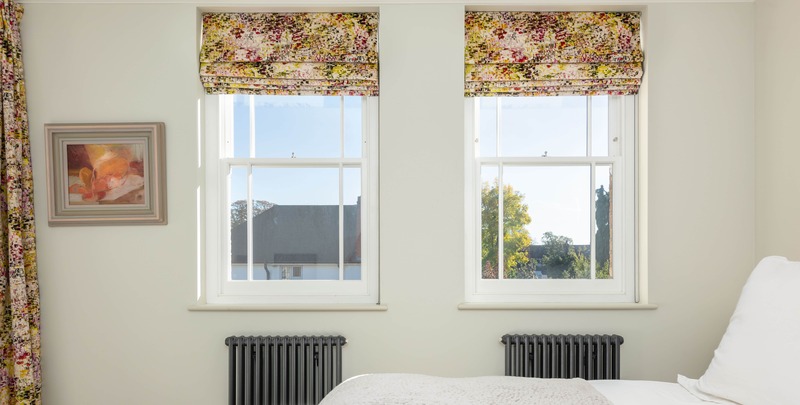 For more information on replacing or restoring your sash windows, please get in touch to speak to one of our experts or to get a quote.